My mum and I have been working on growing our own crop of vegetables and we finally got some rhubarb from this week's harvest. In case you were wondering, rhubarb is actually a vegetable, but it is mostly used in the kitchen as if it were a fruit. With our crop finally producing, I thought what better way to celebrate our first rhubarb than with an apple and rhubarb cake!? I used a basic butter cake recipe for this cake, and once the batter was in the tin, added a layer of stewed apple and then a final layer of cooked rhubarb. It was just delightful. 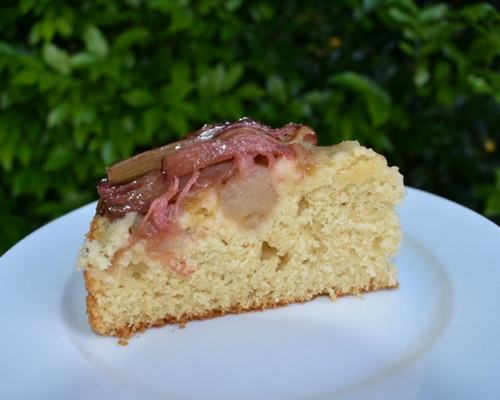 The green and pink of the rhubarb adds a prettiness to the top of the cake and the tartness is perfectly complemented by the stewed apple. Because of the amount of sweetness the apple brings, I used a stevia/raw sugar combination and only put in ¼ cup (because stevia is twice as sweet as normal sugar) but I've included my traditional ingredients below for you. 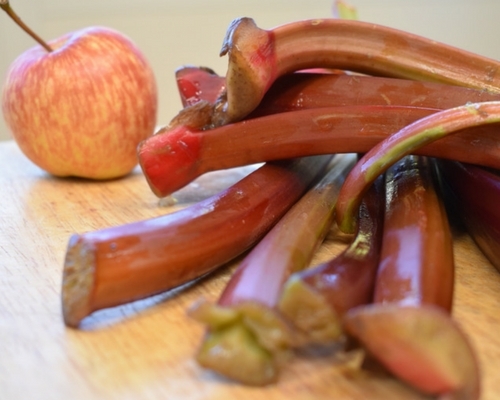 Remember, when using cooking with rhubarb, be aware that the leaves are poisonous - ensure they are removed and thrown away before you start using the stalks. Topping - 1 tablespoon butter, 1 tablespoon brown sugar. 1. Preheat oven to 180°C. Grease and line a round spring form tin with baking paper. 2. Peel rhubarb, chop into 4cm long pieces (approx.) and place in a heat proof dish. Microwave on high for 3 minutes to soften. 3. Cream the butter and sugar using electric mixer on high. Turn mixer down to low and add eggs one at a time, mixing well. 4. Turn off electric mixer and sift in flour and salt. Fold in gently. 5. Add milk and vanilla essence. Fold until combined thoroughly. 6. Pour cake batter into lined tin. 7. Top with the stewed apple and spread out evenly in a thin layer. 8. Lay out cooked rhubarb in a decorative pattern. I used a circular, spiral pattern, starting from the inside and working my way out. 9. For the topping, break the butter into pieces and place randomly on the top of the rhubarb. 10. Sprinkle brown sugar over the top of the rhubarb. 11. Bake in a moderate oven for 55 minutes or until a skewer poked into the centre of the cake comes out clean. 12. Cool in tin for 30 minutes then remove from tin, transferring to wire rack to finish cooling completely.